Information: Class 4F locomotives were the most powerful six coupled locomotives of the type built by the Midland Railway and later London Midland Scottish Railway (LMS). Details: Like most successful locomotive designs the Class 4F traces back its heritage through earlier construction; in the case of the 4F its’ immediate predecessor being the 3F. Between 1924 and 1941, 575 locomotives were built at company owned works Derby, Crewe, St. Rollox, and Horwich. In addition three outside suppliers were also employed to construct the large volume required. Included in the total numbers were 5-locomotives built for the Somerset and Dorset Joint Railway (S&DJR). The 4F’s were common sights during the 1940’s and 1950’s, hauling typical mixed goods trains through-out the Midland Region. They were also commonly used as banking engines on the steep Lickey incline. It was not an uncommon sight to see the 4F’s in use as mixed traffic engines and were even double headed for heavy passenger traffic on the S&DJR on occasion. All the locomotives were taken into British Railways ownership in 1948. 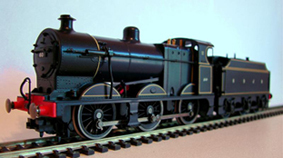 Other than the five locomotives painted Prussian Royal Blue for the S&DJR the locomotives were all turned out in unlined black and remained so through their entire working lives. By the late 1950’s the class was life expired and withdrawals commenced in 1959, being completed by 1966. Four members have survived in varying degrees of preservation.